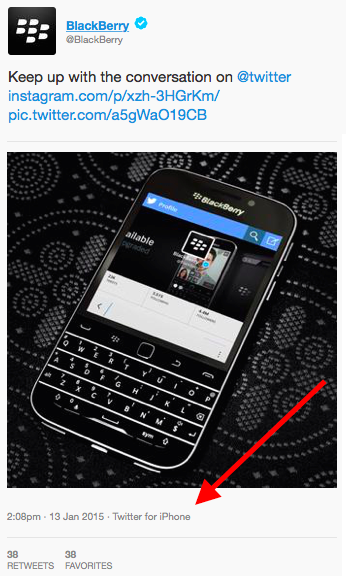 I haven't laughed as hard as my mind knows it should on this yet..
BLACKBERRY SENT A TWEET USING AN IPHONE. As the company struggles to (maybe, with the grace of all the heavens) see a sliver of the popularity it once possessed in the early to mid-2000's, an individual responsible for tweeting on behalf of the company sent out a tweet that was created utilizing "Twitter for iPhone". And of course, this embarrassment has since been removed from Blackberry's Twitter account. Too bad the proof of its existence lives on forever via screenshots.